Welcome to Gadget Dreams and Nightmares, the column that takes you by the hand and leads you by candlelight through the dark maze of gadget announcements to find the jewels at the center. In this week’s labyrinth, we discover a padlock unlocked with the power of a fingerprint, a powered standing desk, and a smart mirror. As ever, these are not reviews, and the ratings indicate only how much I’d like to try each item or consign them to the shadows forever. 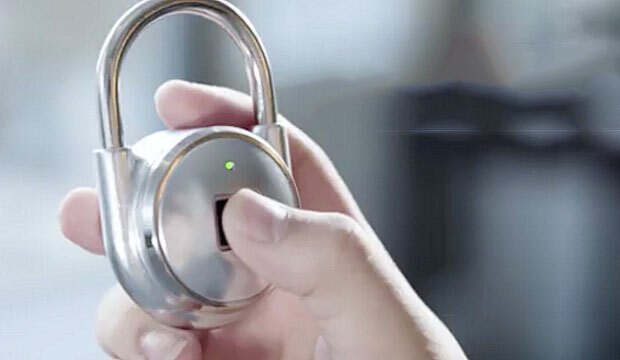 Tapplock is a padlock that unlocks when you press your finger against a sensor to let it read your print. There are other smart padlocks on the market you can unlock using your smartphone via Bluetooth, though there are a couple of points that help Tapplock stand out. First, the price for backers of the crowdfunding campaign is reasonable, at US$29 for the basic version and $49 for the larger model. Second, what you get for that larger model is compelling, since it can charge your phone if you’re in a bind. The battery on that one lasts up to three years on a single charge, while the basic version has a six-month battery life. Meanwhile, Tapplock apparently can recognize your fingerprint and unlock within 0.8 seconds, an impressive feat if accurate. It will sound an alarm if someone tampers with the lock or someone you haven’t authorized tries to open it. A Tapplock can recognize up to 200 different prints, and you can customize access times, location and duration. I had a few initial concerns, including that the Tapplock will fail to recognize my fingerprint, though there’s an option to unlock it using a smartphone. I’d also worry that the battery would malfunction or die unexpectedly. It seems that is a point of concern for the creator as well, as you can receive smartphone notifications prompting you to charge your lock. If the battery does drain completely, Tapplock will remain closed until you charge it with an external power source, which might not prove the easiest of activities if it’s keeping your garden shed secured. There’s a lot to like about Tapplock. The price is low enough that I’m tempted to splurge on a few of them. I’ll try my best not to be that guy who hogs a locker at the gym without being there, but good luck cutting this one off, evil gym overlords. I’ve had limited success in my attempts to construct a standing desk. An uneven dual stack of books almost spelled disaster for my delicate laptop, and though a cheap Ikea table perched on my dining table worked well, it wasn’t exactly the most aesthetically pleasing solution. It might be time to grow up and invest in a powered standing desk that’s actually designed for that purpose. The NextDesk Crossover sits atop your regular desk. At the touch of a button, it changes height from a range of 0.5 inches to 20.75 inches. It’s a slightly more expensive proposition than my makeshift Ikea solution, since it starts at $400 — and you’ll need to pay more for the keyboard accessory if you don’t want to strain your arms. I have been looking for a standing desk solution, and one that switches so easily between different heights hits the mark. Chances are I’ll get lazy and spend most of my time using it sitting down, but it’s nice to know the option will be there. 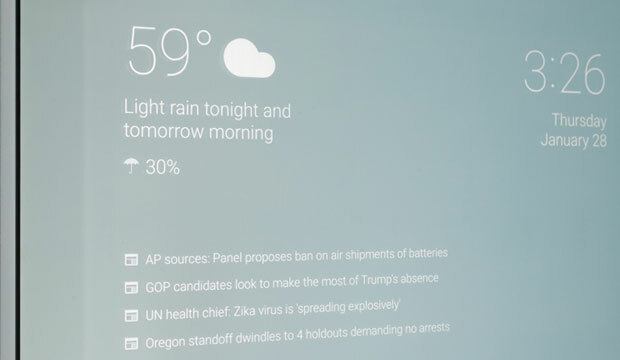 A Google employee hit the news this week after unveiling a prototype smart mirror he made for himself. It displays the time and date, weather, and news headlines. It’s powered with a Fire TV Stick running an Android APK. The display itself is only a few millimeters thick, with the electronics stored inside the medicine cabinet. It’s both a revelation and a clear indicator of where home technology is headed, with connected devices pervading our homes and providing us with access to information we’re looking for at every turn. Placing that information in a mirror is a smart way for us to learn what’s happening in the world while readying ourselves for the day or for bed. I’m not certain I’d much use a smart mirror myself, as I’m not one for looking at my own face longer than I have to, but I’m excited about the idea, and the types of products we might see along these lines in the next few years.